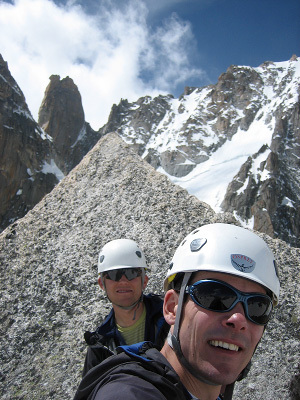 My regular climbing partner, Carsten P. Jensen, and I have gone to Chamonix (again!) for a week of summer alpine climbing. 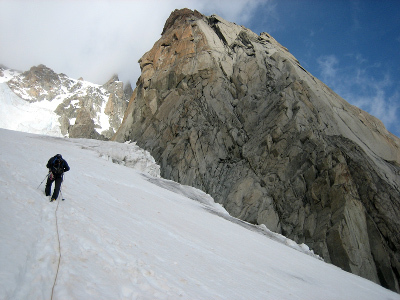 We start our with climbing the East ridge of Pyramide du Tacul, as a tribute to our friend Rune Klausen who died on the route just a few months earlier due to a rappelling accident. Carsten on the approach to Pyramide du Tacul, which is the first mountain right ahead of him. We sleep in the Cosmique hut and start out early the next morning to beat the crowds from the first Midi lift. 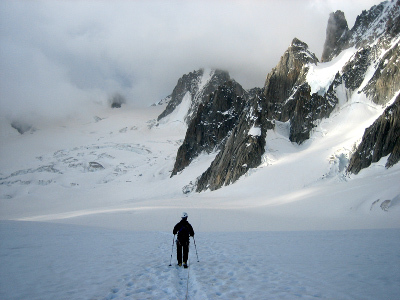 The ridge is gained by climbing up the glacier left of the ridge. Carsten on the final approach to the east ridge. 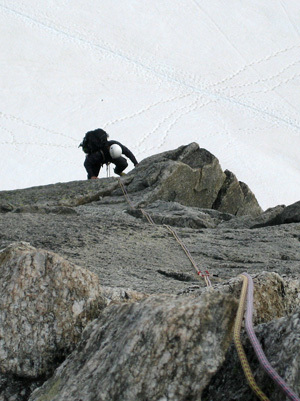 The crux overhang is easily recognized due to the large shadows near the summit. 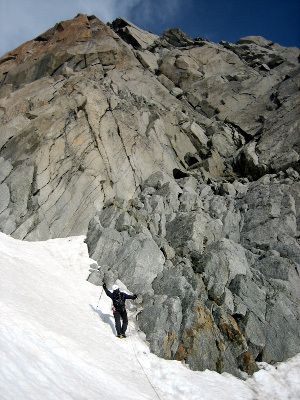 We navigate across a couple of crevasses at the bottom of the route and then Carsten leads of the first pitch, which initially is rather easy terraces. Carsten at the start of the route. The east ridge is gained by climbing up here angling towards the right. Some anchors are in place, but generally the pitch description in the guide book is hard to follow and we are climbing with 70 meter ropes. We thus climb according to our own pace and make our own anchors most of the time. the route climbs up- and rightwards towards the ridge. 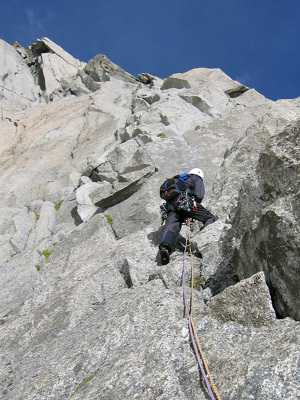 The weather is nice and we can thus climb in friction shoes, which makes the climb substantially easier than in boots. Hans leading the second pitch. The ridge is not super well defined, so the crux roof (top left corner) is a good navigation point. The granite is just great - great friction and very solid. It is a true pleasure to climb the route! Carsten following the second pitch. Before we know it we stand before the crux overhang which had looked quite hard on a picture we had seen in Gaston Rébuffat's classic book on the 100 finest routes in the Mont Blanc massif. It is Carsten's turn to lead and he picks up the rack and sets off. 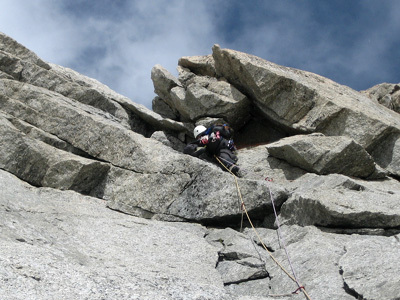 The roof is climbed on the left and turns out to be easier than it had looked, as indicated by the grade of the pitch (IV+). Carsten climbing the crux roof, which is easiest climbed on the left. As indicated by the grade (IV+) it is not as hard as it looks. The great climbing continues above and I get to lead the next pitch, which includes an exposed traverse on the North-East wall. 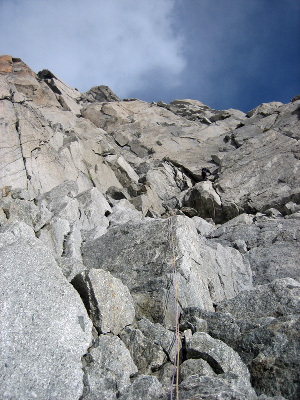 Carsten following on the slabs above the exposed traverse on the North-East wall. Carsten leads our fifth pitch to the summit, which is a perfectly shaped pyramid. 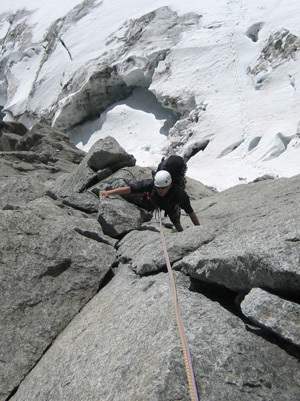 We then start to rappel down the route. I cannot stop thinking about Rune as we rappel. He was a great friend and one of my first climbing partners who took me under his wings and taught me a lot of climbing techniques. I still cannot believe how he could make such a basic mistake and rappel over the end of the rope, but it certainly reminds me that rappelling is probably the most dangerous part of climbing. Rest in peace, Rune - I miss you. Carsten and I at the summit pyramid. Now you know how the mountain got its name!